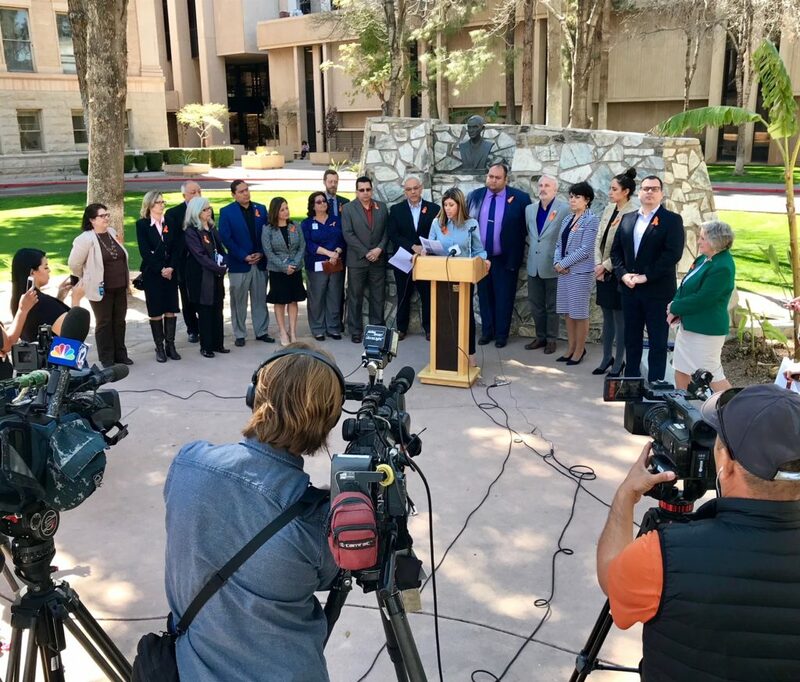 Arizona House Democrats call the Governor's gun safety plan a "missed opportunity" at meaningful reform to curb gun violence and the loss of innocent lives. Arizona House Democrats call the Governor’s gun safety plan a “missed opportunity” at meaningful reform to curb gun violence and the loss of innocent lives. Since the Parkland High School massacre a few weeks ago, students across the country have been demanding that elected officials do their jobs and protect them against gun violence in schools and other public places. Last week, 75 students visited the Arizona Legislature and the Governor’s Tower to ask for legislation on universal background checks, banning bump stocks, and more counselors (not more guns) in schools. What else could be done in Arizona? Below the fold, you’ll find a list of Democratic bills that never got a hearing. In the Legislature, we all have our niche based upon our education and experiences. As you all are most likely aware, my seat mate Rep. Randy Friese was one of the trauma surgeons who saved Congresswoman Gabby Giffords’ life after the shooting spree at the NW Tucson Safeway in 2011. Gun violence prevention has been his issue. Friese had the guts to run on an anti-gun violence platform back in 2014– when no one was talking about this. (I remember when I shot this video of him.) Friese introduces some gun reform each year. Here are the bills he introduced in 2018. HB2023, prohibited weapons; bump-fire device; accessory. HB2024, firearm sales; transfers; background checks. HB2140, mental health; injunction; firearm possession. HB2299, domestic violence offenders; firearms; seizure. Gun violence prevention is not about the 2nd Amendment. It’s not about weaponry. It’s not about schools. Innocent people are shot one by one every day in the United States. Enough is enough. We must create policies that balance social responsibility and public health with individual liberty. This weekend in Tucson– and across the country– people will be participating in the March for Our Lives. If you think politicians should go bold against gun violence on our streets, in our homes, in our churches, and in our schools, show up on Saturday and bring your friends. We must break the stranglehold the NRA has on our country. These kids are not going away. The NRA knows it has backed itself into a corner by never bending, and now they’ll play games and hope things blow over. And in the off chance things don’t blow over, they’ll be in court, fighting whatever gains are made. The NRA is a terrorist organization and any politician who takes their money is supporting terrorism. Look at the video of those kids, in detention for protesting school shooting, sitting quietly, and try not to be moved.